A heavy bag stand is a must for people who want to hit a heavy bag but lack a suitable location for hanging them. We recommend purchasing a stand if you are unable to install an ceiling mounted hanging device because of high ceilings or structural limitations. We cover some of the popular popular punching bag stands from the major martial arts accessory companies like Century, Everlast and Title. If you don’t have space for a hanging bag or don’t want a free standing heavy bag, then definitely check out the reviews below for more information on good stands. The Century Heavy Bag and Speed Bag Platform is a steel constructed stand that can hold both a heavy bag and a speed bag. The stand weighs about 79 pounds without any bags hanging from it. While the heavy bag hanging component is not height adjustable, the speed bag hanging component adjusts between 67 and 79 inches and operates on a ball bearing swivel allowing for quick action. The stand has 3 pegs at the ground level that you can put weight plates in order to stabilize the stand. Unless you plan on bolting the stand to the floor, these plates are an absolute necessity, as the entire platform would move around the floor or even tip over if you were to use a heavy bag without them. This can be a drawback for some customers, simply because weight plates are an expensive investment for those who do not already own them. Once stabilized, hitting a heavy bag hanging from the Century Heavy Bag and Speed Bag Platform is good for developing power and cardio fitness, however the bag lacks the dynamism of a regular hanging heavy bag as you do not have the ability to circle the bag or work angles into your routine. Hitting a speed bag hanging from the platform is good for training, since a speed bag should be a more stationary target anyway. The Century Heavy Bag and Speed Bag Platform is a solid, well-constructed piece of equipment that should last a long time. We really like Century products and recommend it to those who want a quality stand and don’t mind the investment. 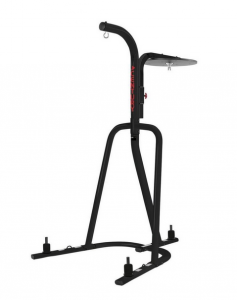 The Everlast 2 Station Heavy Bag Stand is a steel constructed stand designed to hold both a heavy bag and a speed bag. The stand weighs 72.2 pounds without any bags or added weight. It is constructed of steel and is easy to assemble. It has 3 pegs on the base that require added weight plates in order to prevent the stand from moving around the floor or tipping over while in use. This bag can support heavy bags up to 100 pounds. It can also be bolted to the floor. Hitting a heavy bag hanging from the stand is ideal for developing power in your punches and working on your endurance. However, it is not ideal for strategic training purposes as it does not allow for angle changes and circling. A common complaint about this product is that the speed bag component, which is made of particle wood, is not particularly durable and starts to chip and degrade with heavy use. Another common complaint is that the swivel is not well constructed, which prevents the speed bag from swinging properly, so many customers replace it with a swivel from a different company. Overall we think this product is decent and if you are set on an Everlast product it is a fine choice. 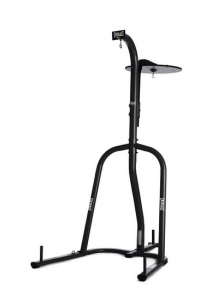 The Title Heavy Bag and Speed Bag Stand is constructed from heavy duty 1.5mm square tube steel, has a steel I-bolt for hanging a heavy bag and a platform for a speed bag. It is 80 lbs without a bag. The stand can hold a heavy bag weighing up to 100 lbs and is height adjustable and fits well in rooms with 8 ft ceilings or higher. 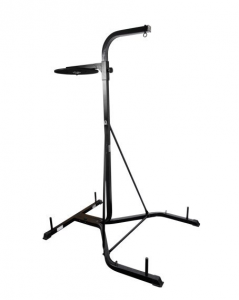 Unlike other combined Heavy Bag/Speed Bag Stands, the Title stand has 4 pegs on the base on which you need to place plate weights in order to add to the stability of the bag, which ensures that the stand does not move around the training area when in use. Once mounted, the Title Heavy Bag and Speed Bag Stand is most effective for developing power and aerobic fitness, however is not an ideal training scenario for people who wish to train their foot work, take angles, or even kick, as a stray toe might connect with the hard steel base and lead to injury. We think the speed bag platform and swivel are well constructed and durable, meaning that this should be a long lasting product. The Title Heavy Bag and Speed Bag Stand tends to be cheaper than comparable products from Everlast or Century, making it a sound investment for anybody interested in heavy bag and speed bag workouts without modification to the training area. As a result, we give this product a solid recommendation and think this stand is a good choice. If you want to find a good bag for your stand, then definitely check out out reviews and homepage where we list many of the top heavy bags available. We also list and discuss several very food free standing bags that are great alternatives to the traditional hanging heavy bag. You can also take a look at our other punching bag stand reviews for more info.